The US study found three in every 100 people injured by rubber bullets died as a result. 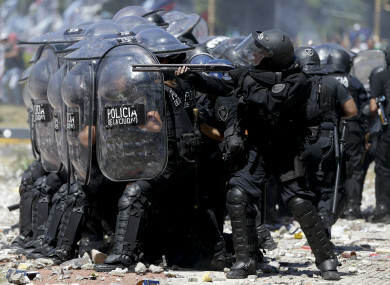 A police officer fires rubber bullets at demonstrators during a general strike against a pension reform measure in Buenos Aires, Argentina, earlier this month. ABOUT THREE IN every 100 people injured by rubber bullets died as a result, according to a review of recorded casualties published Tuesday, calling for alternative crowd control measures. A team of US-based researchers looked at 26 scientific reports published on injury, disability and death caused by rubber bullets between 1990 and 2017 in Israel and the Palestinian territories, the United States, India, Northern Ireland, Switzerland, Turkey, and Nepal. Also known as kinetic impact projectiles (KIPs) or rubber baton rounds, rubber or plastic bullets were introduced by the British army in the 1970s for use against rioters in Northern Ireland, deployed against South African protesters in the 1980s, and adopted by the security forces of Israel and further afield. They are meant to stun rather than kill people as a means of riot and crowd control, but have left a long line of victims in their trail. The new study sought to count the toll. “We find that these projectiles have caused significant morbidity (injury) and mortality during the past 27 years,” the study authors wrote. The team pointed out that other crowd-control weapons such as tear gas, water cannons, acoustic weapons and electric tasers, have also caused “significant injury” over the years. “This discussion does not in any way suggest that other weapons are safer,” they wrote in the online journal BMJ Open. But it did imply that “appropriate use of force and alternatives to weapons must be considered in all contexts,” the researchers concluded, and appealed for the urgent creation of “international guidelines” on the use of crowd-control weapons. Email “'Blindness, removal of the spleen': Study finds rubber bullets are not safe”. Feedback on “'Blindness, removal of the spleen': Study finds rubber bullets are not safe”.